Frankly, I'm tired of this. Two seasons ago, I was lucky enough to score great tickets to a Yankee game in early April against Cleveland. Since it was a night game in New York City, the temperature announced dipped to around 40 degrees. It was actually far worse than that. With the wind whipping around the stadium, it got to way below freezing. Despite the great tickets (5th row up from the dugout on the 3rd base side—waiter service!! ), my wife and I left in the 6th inning. Her teeth were chattering. This year, the World Series was delayed—for two days—because of freezing rain and temperatures around 38 degrees—or not unusual weather for the northeast part of America in late October. And this kind of situation—freezing fans watching fall baseball is not unusual. 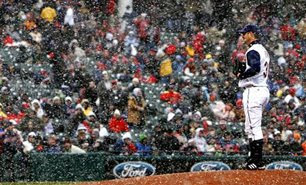 Last season, Josh Beckett pitched through a light dusting of snow flurries in game 1 of the World Series in Boston. Later in that World Series, temperatures in Denver got down to the upper 30s for game 3 and 4. The 2006 World Series, played in Detroit and St. Louis had typical autumnal weather associated with those cities; at or below freezing, and had fans shivering in their scarves and ski jackets. 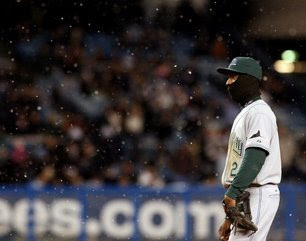 In early April 2007, Cleveland had to cancel an entire four game series against Seattle due to a snowstorm in Cleveland. The Indians were also forced to play another series against the White Sox in weather that dropped into the 20s and with wind gusts up to 25 miles an hour—or so strong it shook a small decorative fiberglass panel in the upper deck of Jacobs Field loose. They then had to travel to Milwaukee to play a "home" series against the Los Angeles Angels. A "home" series in a stadium over 400 miles away. That season, games in Detroit and Chicago were cancelled as well due to snow and cold weather. Last week, MLB.com released an early schedule for the 2009. On it, it showed that we will have November baseball, with a potential game 7 being played on November 5th—weather permitting. If the World Series next year takes place in Detroit, New York, Boston or someplace like that, it could very well be snowed, sleeted or frozen out. This is ridiculous. With lengthening schedules, MLB is just asking for trouble—more and more games cancelled in March or October due to weather that is in no way unusual. As Peter King wrote this week on SI.com: "I found it incredulous that Major League Baseball would allow the championship game of an incredibly interesting season to be contested -- at least two innings of it, anyway -- in a Nor'easter." And the way things are going—with longer schedules and seasons dragging from March to November—this could be an annual affair. Now I am not saying that MLB should turn to some half-baked NFL-type solution; i.e., play World Series in some southern city of random choosing. That's a cop-out. No, MLB should definitely keep the system it has now. The answer is relatively simple: Shorten the season. Schedule more double-headers, one every two weeks throughout the season, cut a few off days (the average ballplayers make in a season what most people make in a lifetime—they can rough it out with a few less off days), and the season could be shortened up 2 to 3 weeks. And that way, you don't have baseball played in a sleet storm in Minneapolis or Chicago. Also for the first week or so of the season, either schedule games in warm weather stadiums or in domes, (something Selig is against) or play the games during the day, so your fans aren't sitting a stadium with temperatures plummeting to the 20s. As Johnny Damon said when the Yankees home opener had to be rescheduled due to freezing rain. "It shouldn't be that tough," Damon said to schedule warm weather and dome teams at home the first week of the season. At least then you have a fighting chance to beat the weather. "Is it raining or snowing up in Toronto right now?" Damon noted. "This very easily could have been avoided....We'll get through it. But there's a couple of domes sitting empty right now." It's ridiculous that the Boys of Summer, playing a game synonymous with bright sunny days and balmy summer nights now play their championship game in front of red-cheeked fans closer to Thanksgiving than Labor Day. And it's ridiculous that sleet...sleet...forced a postponement of a World Series game in the middle of the 6th inning. And all this cold weather causes injuries. In 2007, a rash of injuries, almost all pulled muscles, due to cold weather keeping muscles tight caused the Yankees to lose a bunch of their players. Not only Johnny Damon and Hideki Matsui missed time, but also a bevy of pitching injuries in 2007, including Chien -Ming Wang. It got so bad, they had to call someone up from AA to pitch because so many pitchers had already been called up from AAA. As Ronnie Belliard said when forced to play an early season game in miserably cold conditions in Washington D.C., "It's ridiculous. Anybody can get hurt. Your hands are freezing, your feet are freezing. You can break anything out there. Definitely, we should not play." He's right. Studies done at the America Association of Orthopaedic Surgeons show that cold muscles are much more prone to injury. Which puts cold weather teams at a distinct disadvantage to their warm-weather brethren when games are played in March in 20-degree weather for a few weeks. However Selig has rejected starting the season in warm weather sites as it is, in his words, "unfair." unfair? To whom? Neither does Selig show any inclination to shorten the season in any way. On the contrary, the MLB started this season earlier than usual, with the regular season beginning in America on March 31st. Interestingly enough, a study by a meteorologist indicates, that by pushing Opening Day back to just the 10th of April—that's all—cold weather teams would have a 80% chance to avoid snowy or "miserable" conditions. And injuries. And scheduled double-headers are a thing of the past. Can't do anything that will possibly lose a buck. Like I said, I'm tired of this. I understand the reason for trying to make the most money you possibly can. But at what cost? Scheduling March to November baseball makes the product of baseball look ridiculous. Entire series cancelled due to snow. The World Series postponed two days due to freezing conditions. The answer, as Johnny Damon is simple. With doubleheaders, eliminating some off days and scheduling day games early in the season, MLB could avoid all of these problems. First to pick that nit: Minneapolis is domed. Other than that I totally agree. And the eternally long baseball series. I think hurts it. I know I don't watch as much I used to because it isn't gone long enough for me to miss it. Selig's reasoning is wrong in so many ways. They already do schedule some games to avoid bad weather. They don't schedule as many day games in Arlington for the Rangers from basically June on because it gets so hot. 1st minor thing. The Twins are getting a new—outdoor—stadium in 2010 or so. So, get ready for some cold Minnesota baseball. And yeah, I wanted to write about how they scedule night games in July for Yankee getaway days. So the Yanks have to play a night game in Arlington, then take a flight back to NYC, to play another game the following night. Why? Because it's so damn hot in August in Texas. So why not do the same for cold weather teams in the north? Makes no sense?